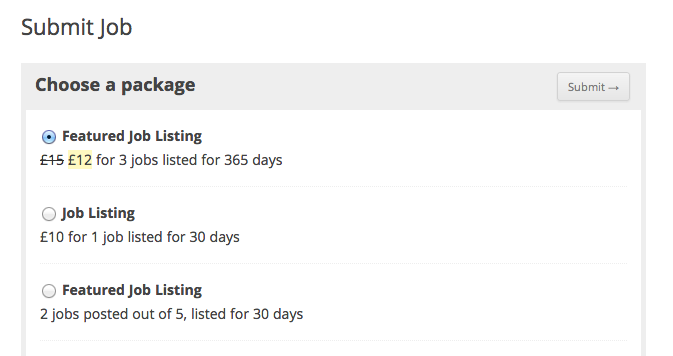 WooCommerce Paid Listings is a plugin for WP Job Manager which lets you purchase Job Listing Packages and (as of v2) Resume Packages (as products) which are then used to post listings. After installation the first thing you’ll need to do is setup some products in WooCommerce which job submitters can purchase. Job Package – A package which lets a user post X jobs before expiring. Resume Package – A package which lets a user post X resumes before expiring. Requires Resume Manager add-on. Job Package Subscription – Requires WooCommerce Subscriptions. See below for more information. Resume Package Subscription – Requires WooCommerce Subscriptions and Resume Manager add-on. See below for more information. Enter price and other product details like any other product. Job/Resume Package products can be free or paid – your choice! 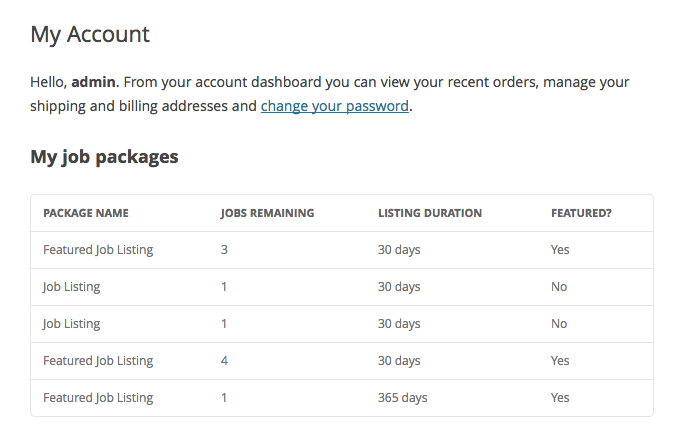 Listing limit – How many job or resume listings this package lets you create once purchased. Can be left blank for unlimited posting. Listing duration – How long job/resume listings last (in days) before expiring when using this package. Feature listings? – Whether or not job listings should be featured when using this package. The published package will then be available during job submission. Job Packages can also be subscriptions, but this requires the WooCommerce Subscriptions extension from WooCommerce. You can have both Job and Resume Subscription packages. Subscriptions can work in two ways. If the subscription is linked to the package, the user will be able to post X amount of listings per subscription term. Renewals reset the package and allow the user to make more postings. If the subscription is linked to the listing, the user will be able to post a limit of X active listings which will expire when the subscription expires. Failure to renew will expire the listings. User chooses a package and clicks submit. If this is a new package, it will be added to the WooCommerce cart, referencing the Job ID. Once paid for, the job will be approved and the package assigned to the user. If this is a package that has already been purchased, the job will be submitted right away. The same flow is used for resumes: Enter resume details > Preview > Choose Package > Checkout. Since Job Packages need to be assigned to a user, WC checkout will force registration. Guest purchases are not allowed. If the order is unpaid, or isn’t one of these statuses, the job will not be approved without admin intervention. Users can view their purchased/active job packs on their ‘My Account’ page. It will show the main highlights of each pack as well as jobs/resumes remaining. my-packages.php A tabular list of packages a user has bought – shown on the ‘my account’ page. package-selection.php A list of radio buttons to select a job package, or a previously purchased package. resume-package-selection.php A list of radio buttons to select a resume package, or a previously purchased package.